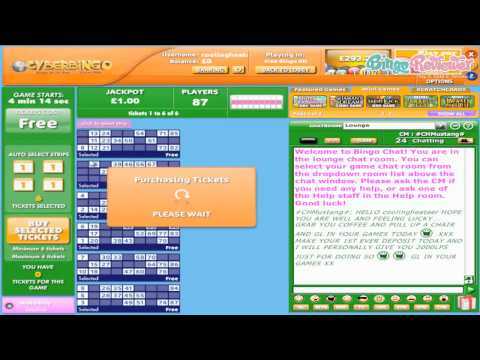 I have got to say Cyberbingo is my favorite site in the Vista Gaming Group. I've always been lucky playing there and even when the luck isn't of the good kind, I had fun. I like to play in the Classic room, which usually has much fewer players as it is exclusive to Cyberbingo and not networked with the other VG sites. This makes it easier to win and also easier to get your hands on the generous bbs available for playing. Their reload bonuses are not quite as high as the other VG sites, but still reasonable. Depositing and withdrawing instructions are clear and the time to do each are very reasonable. With daily weekly and monthly free draws from your bingo points, it's a good idea to register a few plays for the draws. I've won a couple over the years and it's always nice to wake up to money in your account. Loyalty points can add up to free play as well with the more you deposit, the more available for you to redeem. With great chat hosts and good customer service by live chat, email, and tickets, there's a lot of reasons to get in there and win! I discovered this place quite recently, and I like it very much so far. OK, the site could be looking a bit better, and when you say cyberbingo, you don't think firstly of a funny looking, fat, bear. Well, it turns out that the site is operating from 1996. and that it is one of the older sites around, so no wonder they have a nice and not so small community of dedicated players, always ready and happy to assist you, should you need anything. The welcome offer is great, first you get a $5 no deposit bonus to play around and test things out, and then when you're ready to deposit, bam! 500% bonus on your first deposit, and 250% on the second and third deposit. There are also reload bonuses and they go up to 100%. I was only just a bit disappointed by the bingo offer, since there are only 75 games, and that's just not impressive. I do expect them to add some more variants. Cyber Bingo Columbus Day 1K Party! Includes 10 Free Spins + $25 Bingo Tickets.